As far as I can tell, this is the only version of Sofirn’s C8F. At the time of writing, the C8F looks to be around $26. This is a nice C8 variant, but I have found the UI to be difficult. I like it overall, and would like a lot more with a better driver. The C8F ships in a small cardboard box. There’s no printing on … in fact nothing but what looks to be an inventory sticker. The manual is in German and English. This light has a nice in-hand feel. It’s built to the same level of quality as most C8’s I’ve handled. The anodizing feels thicker than another C8 like the Convoy version, for example, but in reality I don’t have a way to measure that. It’s just a feel thing. The light comes apart in three main parts: Head, cell tube, and tail. The light can be further disassembled, by removing retaining rings in the head and tail, to access those components. The retaining ring on each is screwed in, and has dimples for ease of unscrewing. The bezel may also be unscrewed easily. This is where I ran into an issue with my C8F. I unscrewed the bezel and the glass fell out (not a problem). I tipped the light over to remove the reflector – which is a nice milled/polished aluminum reflector with a good bit of mass – and with the reflector one of the three emitters fell right out. Up til then the light had been working fine and the emitter had been attached properly. The traces look… ok – I’m no trace expert … I don’t think it was heat that caused this emitter to fall off, I think it was poor connection from the start. This is a standard C8 body size – the XintD C8 I have below is a bit longer than usual. There’s a lanyard included, which connects through the tailcap. There is no pouch or any other means to carry this C8F. The lanyard works well on these lights, and is a fairly standard C8 accessory. There is no pocket clip, nor is there really a place to attach one. 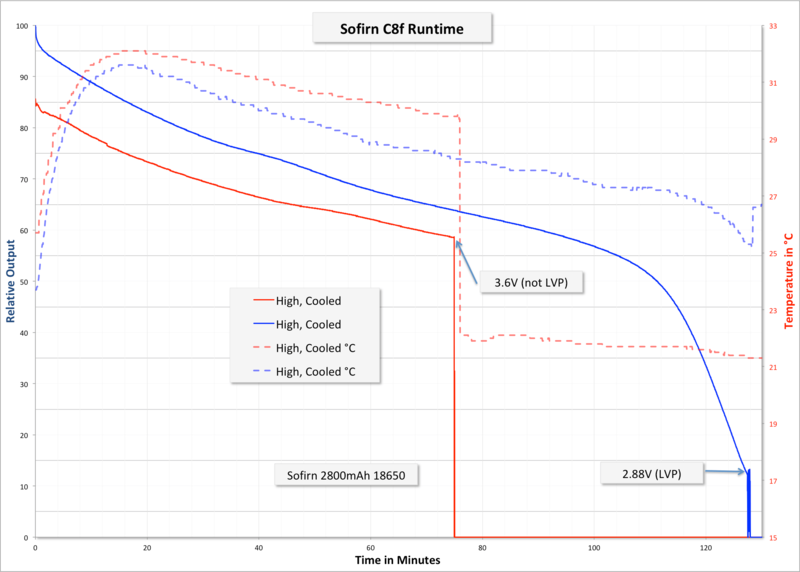 The Sofirn C8F is powered by a single (included) 18650. The provided cell is a button top, but as there are springs on both ends, I believe just about any 18650 will work with this light. Note that the working voltage doesn’t include the possibility to use two 18350 cells. Below is are two runtime tests on high (not turbo). One test I stopped early, but the other concluded at 2.88V. Temperature was moderate throughout the run. Both tests were cooled. I did not test this light on Turbo, and now I can not run a meaningful test since one of the emitters is gone (and dead too – I killed it with some tweezers). 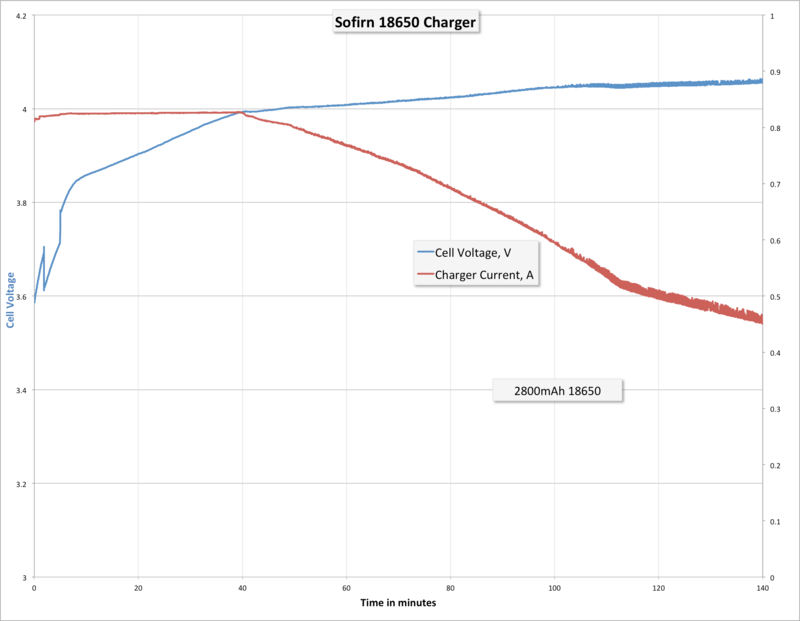 Sofirn also includes this little charger. I’ll be honest and say I had average expectations of this charger, but it really performs reasonably, charging the included 18650 at over 0.8A during the CC phase. That’s… actually quite good. It’s powered by a micro-USB cable, which is also provided. There’s just one switch on the C8F, a mechanical tail reverse clicky. The UI is unfortunately not the best UI. There are two mode groups. Selecting between them is achieved by half pressing when the light is on. The light will confirm the group change by blinking a couple of times and turning on to turbo (!!!). Now the downside. The “good group” (which has Low) is dominated by strobes. By “dominated by” I mean this: Past the 4 main groups, there are a series of strobes, the first of which is an off followed by a turbo flash. Then the other strobe modes. What happens is this: You cycle the modes looking for low. You pass Turbo and the light seems off – or is that low? Look into the light to check and boom, turbo to the eyeballs. Anyway to change the modes, just half click the tail switch. Or full click will progress the modes too, if done within a few seconds after turning off. Group 1: Low (and it is really quite pleasingly low) > Medium > High > Turbo > SOS (though I don’t think it’s proper Morse SOS [timing is off]). In the SOS group, it’s possible to double click for more strobe options. Group 2: Medium > High > Turbo. Double click for strobe. Note that these mode groups don’t match with what Sofirn has listed on the amazon page. The emitters are Cree XP-G3, and are neutral white. XP-G3 has been slammed, but honestly I don’t find the tint to be too bad. Certainly useable, and useful in a light like this. The beam is just about as one would expect with a triple like this. The individual reflectors can be identified in the beam pattern, but not worse than on, say, the BLF Q8, which no one complains about. Yes, the hotspot might be a little less than ideal, but the spill is quite nice. On lower modes too, the beam is quite nice. The triple is nice, and a nice departure from regular C8 lights. Overall build quality is good. Full package light, with cell and charger too! In particular I don’t like that one of the emitters fell off the mcpcb. I don’t like the modes of the groups. This could be cleaned up though. I’m working on a bunch of stuff right now! I hope to wrap up a charger soon (SkyRC MC3000) and I have the ReyLight Lan Ti too! After that? Nitecores, Skilhunts, and on and on! Yes, Jacob! I hope to get one of those for review, too!